Spit Beach is a pleasant beach which faces south into St Austell Bay. The beach is just below Par Docks, though fortunately the docks are out of sight. There is a disused pipeline covered in concrete and west of the pipeline is a nice area of sand. East of the pipeline the beach is mostly rocky with patches of sand along the Park Docks sea wall. There are no toilets or facilities. There is a 10-15 minute walk from the car park to the beach, which include steps to a footbridge, which is unsuitable for wheelchair access. Final access to the beach is via a short slope between the rocks. There are several routes to Spit Beach east of St Austell on the A390. Drive east of St Austell on the A390 and at a roundabout turn right onto the A3082 where signposted to Par Docks and follow this road to the Spit Beach car park. Alternatively approaching from the east at St Blazey, turn onto the A3082 where signposted to Par. Follow this road to a mini roundabout and turn left to continue on the A3082. Follow this road past Par Docks and the Spit Beach car park is shortly after the railway bridge on the left. At the car park there is a foot path under the railway bridge which joins up with the coast path. 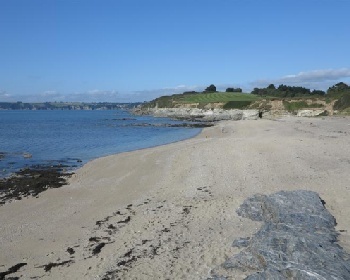 Take the coast path west and the beach is about 10 to 15 minutes walking. 1 car park a 10-15 minute walk from the beach..